Celebrations for One Year to Go until the start of the 2nd European Games in Minsk were held across the Belarusian capital today and culminated with the re-opening of the iconic Dinamo Stadium and the unveiling of a Minsk 2019 Countdown Clock. Members of the European Olympic Committees (EOC) joined the organisers of next year’s European Games for a full range of activities to mark the occasion. The day began with a 10 km charity run from Dinamo Stadium to the headquarters of the Belarus National Olympic Committee. Proceeds from the run will go to a local charity that works with disadvantaged children. The re-opening of Dinamo Stadium, which will host the athletics events at next year’s European Games as well as the Opening and Closing Ceremonies, was commemorated with a music concert, athletics relay, football match and fireworks display. Renovation of the multi-purpose venue started long before Minsk was awarded the European Games and took six years to complete. 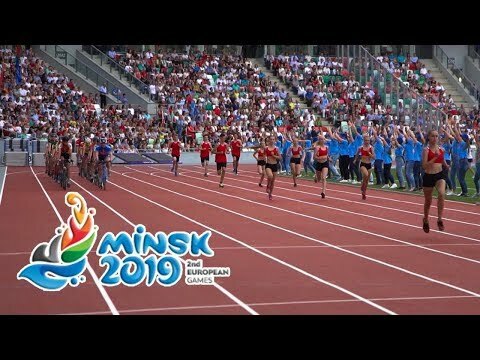 International Association of Athletics Federations (IAAF) President Sebastian Coe and Belarusian Olympic sprint champion Yulia Nesterenko were on hand to start a 4x100 meter relay race featuring local youngsters. Tomorrow, the stadium will hold a track and field event which will serve as a test event for Minsk 2019 and feature teams from Belarus, Ukraine, and Baltic and Balkan countries. A Minsk 2019 Countdown Clock located outside the Sports Palace, an official venue for the European Games, was also activated during the ceremony. The daily competition schedule of the sports programme during the Minsk 2019 European Games was recently approved by all European Federations involved. Click here for the full schedule. There will be 91 men’s events, 89 women’s events and 21 mixed events in total, with 115 universality spots available. All 12 sporting venues, of which 11 are existing facilities, will be located a maximum 30 minutes’ drive from the Athletes’ Village, ensuring athletes can easily travel to training and competition facilities.